Adidas Adipower Weightlifting Shoes 2019 - Turn On The Beast Mode! Adidas are renowned for providing high-quality weightlifting shoes. The following is an Adidas Adipower review, followed by an analysis of the Adidas Adistar weightlifting shoes. Adidas are also known to provide the best quality shoes for Tai Chi, Kung Fu, and Kickboxing. In terms of weightlifting, Adidas are the best providers of high-quality shoes, and the Adipowers and Adistars are renowned in the world of weightlifting. Why Adipower is the best for Weight training ? Weightlifting shoes are an essential component of any lifting regime. The energy is channeled from the floor to the bar by friction supplied by the weightlifting shoes. Click here to know more about lifting shoes. To put it simply, lifters are in agreement that a good pair of lifting shoes increases the amount of weight that can be lifted. If more power can be generated through the floor then the bar can be pulled higher, and this means that the chances of getting under the bar greater. The shoes most people wear are actually made for running, which means that they have an inbuilt cushion to absorb the impact with each step taken. While this is great for running, it is destructive for weightlifting. Because the same mechanism that helps absorb the shock in running absorbs the power in weightlifting, meaning less weight is lifted. Thus, it is actually better to go barefoot or with a flat pair of shoes that the standard running shoes which are designed to protect the ankle and knees from the shock of the legs thumping the ground systemically. It is a trade off in terms of depreciation of the human body, but it is definitely a smarter choice to have a pair of running shoes and a pair of lifting shoes because they are different exercises and to get the most out of each, special shoes are a wiser option. There are a number of important factors to look out for when choosing what type of lifting shoes to buy. Weightlifting shoes have a raised heel which is a significant advantage. It allows the lifter to squat more deeply, which means the angle is better for pushing the bar upwards with less force and it will also improve posture. This is essential given that serious weightlifters are lifting every day. In order to minimize depreciation of the body proper posture is essential, as otherwise, it could lead to permanent injury. Correct lifting posture will also improve your posture off the lift. This means you take correct posture with you when sitting in chairs or standing, which also affect how efficiently your body channels energy when not lifting. The heel also allows more energy to be channeled directly upwards. Any horizontal channeling of energy is wasted as this is not where the bar is supposed to go. Powerlifting shoes also have the advantage of being stronger around the edges of the shoe as opposed to the standard minimalist shoe. The shoes should be static and you do not want to go over the shoe edge.This is essential for both the efficiency of the lift and for preventing injury. The height of the heel is probably the most important factor when determining what pair of lifting shoes to buy, followed by the strap and support. Some shoes do compromise on a stable base a little in order to provide more versatility for different sports, such as CrossFit. Generally, pure weightlifting shoes will have a solid base. 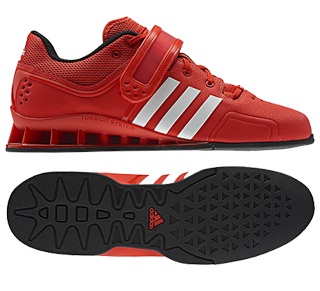 The Adidas Adipower powerlifting shoes are an expensive pair of shoes, but are lightweight and provide the stability for powerlifting. They are also an ideal brand for CrossFit, as they are versatile enough to perform on a number of training platforms. Features include PU coated leather, vent flow opening and a strong midsole. The chassis is engineered for weightlifting with special polymer for extra strength. They are a stylish weightlifting shoe and come in a variety of colors and sizes, with a single instep strap and breathable air mesh on the PU coated strap. The Style is actually an important consideration in terms of weightlifting, and these are one of the most stylish pairs available. This is because of sports psychology. If the lifter thinks he looks great in his shoes it will tie into his image and his self-confidence will increase, which translates to a bigger lift. The Adidas Adipower lifting shoe has a good name in terms of durability. They are known to last for longer than two years. While stiff at first, the shoes gain some flexibility when they are broken in. While the Adipowers are a good brand, they can be quite expensive. The Adidas Adistar weightlifting shoes are a viable alternative. These are an older version and there are a number Adistar weightlifting shoes for sale on sites such as eBay. These shoes are classics and are a good pair to purchase as a first time buy. As one of the first original weightlifting shoes, they can provide a good idea in terms of what to expect from a high-quality brand of weightlifting shoes. The Adistars have 3 straps and are an all-time favorite in terms of quality and durability. Weightlifting shoes ultimately form part of a lifting regimen, as the lifter becomes so used to the pros and cons of the lifting shoes over a number of years. These shoes have been known to last for longer than 4 years. The 3 straps help to protect the shoes from losing horizontal support over time. The Adistars supply the full package of a supreme pair of weightlifting shoes. Not only are they highly durable and stable, but they are also very comfortable due to the type of leather used, as well as looking great with a high-quality wooden heel wedge. Eventually, the foot hangs slightly over the sole which is the telltale sign of the Adistars finally giving up. Another pair of good Shoes for Weightlifting is VS Athletics. Check out our reviews in this article.There is a huge amount of information you will need to know about VS Athletics Weightlifting Shoes.